How to teach grammar from scratch? Teaching anything in English beyond the alphabet requires imparting some knowledge of grammar. Can you deny this fact? This knowledge of grammar is intrinsically wired in the native speaker. A child born in New York city would know how to describe his likes and dislikes in understandable English by the time he is five. But can you say the same for a five-year-old student from a country like India that has English as its second language (ESL)? For these non native English students, an explicit grammatical foundation is essential; something which the native speakers have developed through their surroundings without much conscious efforts on thier side. And in the wide open sea of grammar there are way too many things to cover individually. Moreover, there grammatical concepts never exist as can-be-teach-in-isolation entities. They are all interrelated. Anyone who has studied grammar to any extent can easily relate to this. So then what is the order in which the various grammatical concepts should be taught to the ESL students? For e.g. should verbs be followed by adjective or vice versa. Of all the complex grammatical concepts that exist, Which terms should the ESL teachers choose for his/her order? And most importantly, from which conce﻿﻿pts should the ESL teacher start his/her grammar lessons when his/her students probably don't know how to speak, read or write sentences at all? These are the ﻿﻿﻿﻿question ﻿﻿﻿﻿that we answer in this post. More specifically the rest of this post provides a template that can be used by ESL teachers to teach their students grammar from almost scratch. This template can be considered as your grammar lab. There is a lot of scope of customization for you, the teacher, to do based on your students requirement but still you limit yourself to certain restrictions in order to achieve the desired output. Create situations ﻿that ﻿the ﻿﻿﻿student ﻿﻿﻿can relate to. . .
We are not going to teach a grammatical concept in its entirety at one place. E.g. Basic Verbs will be introduced in one place and then while covering phrases and clauses students will learn more about verbs also. This will become clear as you read through the content. We are only going to deal with active sentences in this series. And through active sentences you will get a good canvas to introduce the various grammatical terms along with some of their most common usage. These terms, once introduced, can then be further explored to understand more complex applications. We are going to encapsulate the grammatical concepts into sentence tables. These tables, as you will shortly realize, assimilate together different grammatical concepts based on their application in actual sentence formation. For e.g. reflexive pronouns are taught with prepositional phrases to make the student understand prepositional phrase more elaborately. This approach has significantly helped my students significantly increase their retention capacity. This is all because with the help of tables, all the abstract grammatical concepts like adverbs, noun clauses etc are channelized into concrete sentences, making it much easier for students to understand and retain the abstract grammatical concepts. Furthermore, with sentence formation being the driving force, the grammar which will be taught using this approach becomes ‘practicable’ i.e. the student would be able to apply this grammar knowledge to form new sentences that he/she would use in his/her daily conversations. “Create a story like sentence sequence - Involve a set of characters and only make sentences around their life using the various grammatical constructs. Just name the actors in the very beginning and then let them form their characters as different sentences are constructed about them and around them.” - this was the message that I gave myself before beginning any new teaching assignments. This approach will help students realize what more sentences they can come up with, about themselves, based on the ones they have learnt so far. This process will be gradual, but is bound to be very effective for the students. You must understand how to identify noun, verbs and adjectives. This will help you clarify your students grammatical queries quite easily. Use these tests to identify if a word/phrase/clause is acting as a noun, verbs or an adjectives. As for another very important yet often concept: ‘adverb’, there are no fixed questions that can determine if a word/phrase/clause is an adverb. This is all because adverbs are the most flexible of the 8 parts of speech found in grammar. They can come in anywhere in a sentence (beginning, end, after verb, before verb - just about any place you can think of). But still it is still possible in most situations to determine if something is an adverb. To find out more, click here. Note: Anything which is highlighted in ​Blue or purple depicts a word or phrase that does not strictly fall into the present column category e.g. a noun with an adjective like 'big pencil' can used in place of the pure noun 'pencil' and in this case the adjective 'big' would be highlighted in blue. The students must understand basic alphabets and how to form simple words before they can be taught anything related to grammar. ALL SET!! HERE ﻿﻿WE ﻿﻿GO. . .
Nouns (common, proper, collective etc all kind as seen here- dont go too hard on abstract nouns at the moment. ), possessive adjectives (my, her, his etc) + noun, PERSONAL PRONOUNS (I, you, we, he, she, they, it), possessive pronouns (hers, theirs, mine, hers etc), subject complement (simple noun phrases and pronouns as subject complements), articles, subject (simple noun phrases and pronouns as subject). To understand determiners , click here. To understand the difference between a pronoun and a determiner , click here. I feel that this difference is too subtle for the students to understand initially. And there is no harm in avoiding it and letting the students directly make phrases with determiners and pronouns (like Andrew’s car, That plant etc) as per the intuition which they develop getting more exposure to the language. The aim here is to enable the student to form collection of words through which he can identify an object. Here we are only concerned with identifying objects by their names, by their ‘pointed’ location (i.e. this/that/these/those), and their ownership (e.g. my bag, her bag, my father’s bag, Lily’s pet etc). When we mention something’s ownership we are using nothing but possessive nouns. Most of the objects that people talk about in their daily conversations are about ‘specific’ objects such as ‘her bag looks quite expensive’, ‘That (pointing at something) is beautiful’ and ‘Those shoes are very well polished’. Hence this object identification skill will definitely become an handy tool for your students. You must avoid prepositions in this set. Using prepositional phrase to identify objects will be dealt with in Set 4. You should give the students a basic overview about how to use articles - When to use an instead of a the or a etc. The Student must also be taught the basic rules of when to use am/is/are possessive pronouns (mine, hers, theirs etc) and possesive adjectives . All of these rules are elementary yet may be unfamiliar to your non-EFL student. So you might as well revise them with your student. NOTE: After this table note that noun phrases will be assumed to include pronouns as well. So pronouns will not be explicitly mentioned until required. First, explain how to use adjectives attributively (i.e. adjective(s) + noun e.g. My younger sister, my sister etc). Then, explain how to use adjectives predicatively (i.e. noun phrase + linking verb + adjective). See this quick demo. We will use adjectives attributively to say something more about the nouns e.g. the beautiful car, the healthy baby, the blue sky. Another way to modify nouns is through noun adjuncts. In the tables for this set, we will encounter noun adjuncts, which are nothing but words, added before nouns, that act as adjectives. With the help of adjuncts, compound nouns like 5 week’s vacation (5 weeks’ is a noun (again a compound noun to be exact) acting like an adjective for vacation) are formed. Possessive nouns, seen in the last set, are a type of noun adjuncts. With a basic understanding of noun adjuncts, your students will be able to create more complex noun phrases than the ones done in the last set. With adjuncts, our noun phrases will include compound nouns like ‘school bus’, ‘table lamp’, ‘wrist watch’. I personally feel that there is no need to jump into details of formation of these kind of compound nouns to teach students to make them because we use noun adjuncts most of the time without actually knowing about them i.e. we usually use a complex looking noun like ‘Mr Wilson’s car park’ without breaking it down into exact noun and its modifiers. It is certainly quite complex to understand the noun adjuncts, their types and how to use them. As the students get more familiar with english, they would understand better how to form compound nouns (like ‘My pink umbrella’, ‘the large dollar store’, ‘Maternity leave’ etc) on their own. For a quick study of noun adjuncts, click here . Now, explain the comparative and superlative adjective and finally wrap it up by explaining these 2 commonly found contrsucts 1) more/less than 2) as <adjective> as see and similar comparison phrases. Something extra: Clarify the difference between between and an adjective and a determiner here. Adverb of place in the form of single words like here, there etc and in the form of simple prepositional phrases in space (preposition + modifier + noun) like under the desk, below my purse, over that table etc (see here), and indefinite pronouns (somebody, someone, no one). I believe that this should be a nice place to introduce indefinite pronouns. After all, You can always say ‘somebody is there’, ’Nobody is here’ etc. This is the first time when are dealing with prepositional phrases. We are introducing the prepositional phrases in their simplest form, as adverb of place. After this set, with the help of these prepositional phrases, your students would be capable of defining the position of a person/object with respect to her surrounding e.g. Her bag is in the cupboard, She is in the classroom etc. Remember that, in this set, we are not concerned about what the people/objects in question are doing. We are only concerned about where they are at the moment. Action verbs and stative verbs that take a direct object (Include all tenses including perfect tenses), prepositional phrases of time, adverbs of time, manner, degree and frequency, auxiliary verbs, verb phrases. First of all let's talk about adverbs. Adverbs exist in lots of different forms and even clauses and phrases can act as adverbs. But in this set, we are only concerned about words acting as different types of adverbs. Here is a quick overview. This is the first time we introduce the time element in our sentences. Time element is usually done either using simple adverbs like usually, sometimes, yesterday, today, tonight, last night(For more information, click here and here.) or in the form of prepositional phrases (limited to preposition + noun) e.g. in the night, after the film, between the match, since 5 pm. Some of the time phrases point at a specific time (e.g. at 5pm see this) and others point at time durations (e.g. since last year, after 6pm, from monday to friday see this). Here is a quick list of common prepositions used in time expressions. Sometimes time can be presented as a mix of both the categories e.g. everyday at 5pm (adverb of time + pp of time), after dinner usually (pp of time + adverb of time) etc. You should not really force very strict grammatical boundaries on how to represent time and time durations. Just let your students come up with time expression and you convert that into English using whatever phrases (most of them will be covered by above categories) you can think off. The aim of this set is to introduce the student with all the tenses at one go. So far, as you might have noticed, we only dealt with the simple present tense. Now is the time to explode into all the tenses at once. Why all the tenses at once? Wouldn't it be overwhelming for the student? Yes, it will be overwhelming initially but once everything in the table is explained end to end then the students should have much better clarity about the tenses. This is because I have found, while teaching my primary school students, that the best way to introduce tenses is by contrasting one tense with another. In isolation, the perfect and progressive tenses are difficult to understand but when they are given the context of other tenses then it becomes much easier. So I strongly advise you to first explain the famous ‘12 - tense’ table (something like here and here) to the students and then proceed with this set’s table. Modal auxiliaries like would, should, can could must also be taught along with the tenses for e.g. the student must be taught how ‘would play’, ‘should play’, ‘can play’ and ‘will play’ differ in tense and meaning.To get a good idea about auxiliaries look at thi﻿﻿s link. 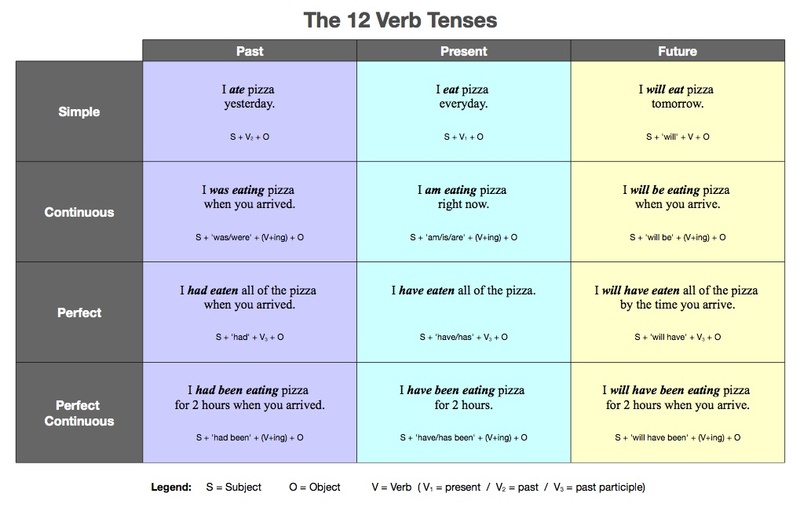 The different forms that verb take in different tenses (and along with different auxiliaries) are also called verb phrases. Read this short text to get a adequate overview of verb phrases. With his set done, students will understand how to describe an action/event in time and space. Describing when and where for events and actions makes these entities more relatable. Hence, It is always better to develop in the students’ the habit of adding a temporal and spacial phrase at the end of their sentences. For e.g. It is better to say ‘I play hockey in my neighbourhood garden at 5 pm everyday’ then to simply say ‘I play hockey’. Addition of time frame to a sentence has an additional benefit. It makes the students use the correct tense in their sentence. That is why a special column for mentioning time and space has been added to this set’s table. This column will be removed from future tables owing to space constraints, but you should encourage the students to provide where and when details in their sentences as far as possible. If the teacher feels that certain clauses must be added for making some of the tenses more meaningful than he/she must do so without hesitation. This is particularly helpful for past perfect continuous and future perfect continuous when 2 events have to be talked about to convey the meaning correctly. Click here and here, for more information. Highlighting the full object i.e. the object plus its modifiers make more sense than identifying the core object grammatically. - Because with the modified object its easier to identify the object in its complete sense with the usual adjectives and articles e.g. I play with a red ball - Play with what? : ball - Which ball? : The red ball. Prepositional phrases are nothing but Preposition + Modifier(s) + Noun, Pronoun, Gerund, or Clause. Modifiers, here, usually add more information to the noun, pronoun, gerund and clause that follows them, and so they need not be taught separately. Prepositional phrases are used as either adjectives or adverbs. Till now we have dealt with prepositional phrases that represent time and space, and acted as adverbs. Now we will learn that prepositional phrases can act as adjectives and subject complement (actually acting as adverbs only) as well. A common application of prepositional phrase as adjective is when they help in identifying objects. Yes we are talking about the same object identification which we learnt in set 1. In this set also we are going to deal with prepositional phrases having the structure: Preposition + Modifier(s) + noun, pronoun. We will deal with clause and gerund based PPs in later sets. Phrasal verbs (like gave up, looked ) will also be seen in the table. Whenever the verb column contains a prepositional phrase then we are dealing with a phrasal verb instead of a simple verb phrase. For understanding Phrasal verbs see this. Gerund phrases, participle phrases (along with naked participles as well), infinitive phrases and prepositional phrases with gerunds, complements: Adjective complement, Subje﻿﻿ct complemen﻿﻿t, Object complement, and Verb co﻿﻿﻿mplemen﻿﻿﻿t. Some verbs are followed by gerunds - some by infinitives and some can be followed be both gerund and infinitive. To get a general idea about this see this video. These 2 youtube videos (here and here) provide exhaustive list of possible grammatical forms which gerund and infinitive phrases can take. Not: in the video o﻿n gerunds there is a mistake - What should have been a participle phrase acting as an adjective has been mentioned as a gerund; Find out which sentence in the video ahs this mistake for yourself :P). For participles read, this and this. For gerunds that take a possessive pronouns read this. NOTE : The infinitive Phrases also change with different tenses see this and this. Most commonly used phrases are infinitive, gerund, participle, noun and verb. Verb phrases are already covered. Noun phrases will culminate in what is called as a noun phrase, which will be part of the next set. So for this set our main concerns is to cover infinitive, gerund and participle phrases. Object complements: “An object complement follows and modifies or refers to direct object. It can be a noun or adjective or any word acting as a noun or adjective.” See li﻿﻿n﻿﻿k. Indirect object: “The indirect object identifies to or for whom or what the action of the verb is performed. Indirect objects are rare and only certain verbs called ditranstive verbs can take indirect objects.To understand more about indirect objects see this. The difference between indirect object and object complement is in terms of meaning rather than grammar. Read this Quora answer and watch this video to better understand the difference. Relative clause, subordinate clauses, noun clause, prepositions with clause as their subject, and noun phrases. For information about each of the clauses mentioned above, see this. For noun clause and there various applications see this. In this link, you will find 9 applications of noun clauses in a sentence. Only a few are covered/explicitly mentioned in the table; rest all have to be taught, if the teacher finds the need to do so, from the link itself. Nouns modified by clauses are also noun phrases. We will see these in the coming table. Examples of noun phrases are ‘I who ate all the ice-cream’, ‘the dog that chases cats’ etc. For more information on noun phrases see th﻿﻿﻿﻿i﻿﻿﻿﻿s. Prepositions which introduce clauses (e.g. after I finished the match, on whomever you identify as the culprit) and those which introduce noun phrases with clause as their object (e.g. of the match which was payed by her) are also part of the prepositional phrase category. These 2 categories will be seen in the table. You will also find new examples of complements wherein clauses will act as adjective, subject, object and verb complements. A lot of clauses start with ‘wh’ sounding words like where, what, why, when etc, and they are together called the Wh-clauses. To get a deeper understanding of these clauses and their various applications, you must visit this. The clauses in the table will have adjectival and adverbial meanings - This has to be explained by the teacher. We will be using the clause table to introduce the conjunctions. Simple uses of several conjunctions is a something which students will be familiar with already like simple uses of and, but to connect small word etc. But these same conjunctions are also used to introduce complex clauses. See this link to understand how major a role conjunctions play in clause creation. Unfortunately, most of the clauses, when used in real life sentences are used in their reduced format. So students must be introduced with the reduced form of clauses along with the clause introduction. Every clause category has a different style of reduction. Here is a link that you can go through to get concrete examples to teach your students how reduction can be done. Also see ‘Whiz-deletion’ . Reduced adverbial clauses can be introduced after teaching the clause table since they are much more commonly used than the full adverbial clauses. To understand reduction in adverb clauses see this. OK. That's ANOTHER way to reduce adverbial clauses. There's nothing special about the verb to be in this pattern; it just becomes being, like drives becomes driving, and went becomes going. Look through all the different types of phrases and clauses that we have dealt with so far and find out where they have been adjectively and where they acted as adverbs. For adverbial use start here: clauses, phrases. For adjectival use, start here: clauses, phrases . Let your students get familiarised with certain popular idiomatic expressions and they may be able to answer why questions like why certain prepositions are used with certain verbs (like beware of, and not beware in) etc. For idioms you may start here. Idioms are also related to phrases verbs and many phrasal verbs are part of an idiomatic expression. See this. Now you have the tools to teach students.Whenever you come up with a new complex sentence see if you can break it up into smaller fragments with each fragment falling under one of the the tables which we have learnt so far. If those fragments don’t fall under any of the existing tables, then try to add something to the existing tables to make these fragments fall. IF this approach also does not work then bang you have a new table idea. Now is the time to create your own table.